I have had an S56E for about the past 10yrs. Love it to bits, a lovely, light game gun, ideal for pigeons, double trigger, choked at 1/4 and 3/4. I will eventually have to replace it, but the question is with what? I suppose a Silver Pigeon will be the nearest to it. If it's pulverised, cut the bad bit off, use the rest. Fly eggs are unavoidable in summer. Crown them, wash em and fillet them, that will get rid of them. They are generally on the outside anyhow. lead is only a danger when it is ingested in small fragments, regularly. An odd bit of shot won't do any harm, it will just past straight through you. You are probably exposed to more lead in your tap water as some where in the supply line there still will be odd bits of lead pipe left in the system In a nutshell, get it down you, it won't kill ya! Ditchman if it's any consolation, I had a similar result on Saturday. Flight lines completely changed from usual, birds wanting to land at the other side of the field, tried every trick in the book to get them to come in properly, without much success and then to add insult to injury, the ones that did sort of decoy were landing with the wind, not into it.? To compound my problems, I have a Mk I 'Hatstand' 30" camo, double mag which I bought on a whim years ago and don't really use that much. Well I decided that I was going to force myself to have a day out with it. Usually my trusty o/u goes with me or my other semi as a second gun, didn't bother. I would have done better trying to clap the '********' between two bin lids! 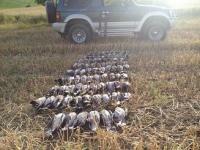 So the end result was 63 shots, 20 birds. Way off my usual hit rate. We all have em! Could the harvest be too early for the Woodies? Hopefully I will be out a couple of times this weekend and will post regarding the bag. I have never seen this before, but literally most of the total batch were young uns. I would normally expect perhaps a third. It's unusual! I am based up in the north and constantly watch the wheat crops in the area as they start to ripen, waiting for the Woodies to start to build as it begins to turn. Now this year, the numbers have not built as they have in past years. Can't help but think that it's all happening a bit soon and the good weather has meant that the birds might be preoccupied with the second or possibly even a third clutch. What makes me think this? Well I went out early the other morning onto one of my permission, after being away fishing for a couple of days to find that pretty much all of the winter wheat had been combined. Speaking with the farmer he reckoned they were at least a month ahead and they had not had to use glyphosate to get it to turn. I had a drive round and a periodic sit and watch to see what was knocking about on the flight lines. Next to nothing with very few birds on the ground feeding. This was between about 9 & 10.00AM. Not even any real amount of corvids! Popped round to see another farmer who I shoot for and whilst we were talking we watched a woody going to and fro from the Sycamore in his yard collecting small twiggy bits, obviously for nest material. Had a look at his acreage of wheat and watched a few woodies knocking about on the summer flight lines. Visited another of my farms and found a number of birds feeding on a patchy bit of winter wheat, which had not done to well due to the wet conditions last autumn/harsh winter. Watched the comings and goings for a while, had a natter with the farmer and decided to have a bash. Ended up with about 90 over two sessions over a couple of days, plus about 20 corvids. What I did notice was that pretty much all the birds that I 'crowned' were all juveniles i.e. they had the light coloured and excessively downy under plumage and underdeveloped neck rings. Next to no adults in the bag. Is this because they are still in the midst of raising young? Anybody else finding anything similar? What do we think? I had two guys on one of my permissions dump 70+ under a hedge last year. Don't think they really should have been on the land (game keepers consent without farmers). Helped them out by giving them the prime spot, they guy professed to be some sort of expert. I shot 100+ on my own and breasted out the lot on my own and vac packed em, not one went to waste. If the ***** lands back on this year he's gonna get told to do one. If you shoot it and it's edible make sure it gets used out of respect for the animal. Don't give the 'antis' a chance to slate us, if they can find away to stop us, they will. I bought one of the higher end Foodseala ones a few years back. Wouldn't be without it. All my pigeon breasts are vac packed with it and look exactly the same when the come out of the freezer and are defrosted months later. The Adrew James rolls that I use are a bit dearer but they are good quality and you can make the bags to the sizes you want. If you can get some photos posted and the gun is as described I will have it. Could pay and collect in person as I will be heading to London on business next week. I live in North Yorks so will be passing Sheffield.